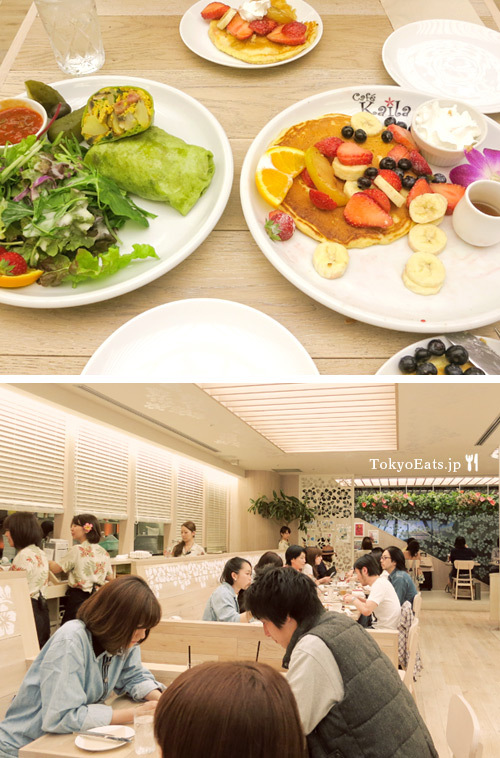 This is probably the Hottest cafe for pancakes in Tokyo right now. 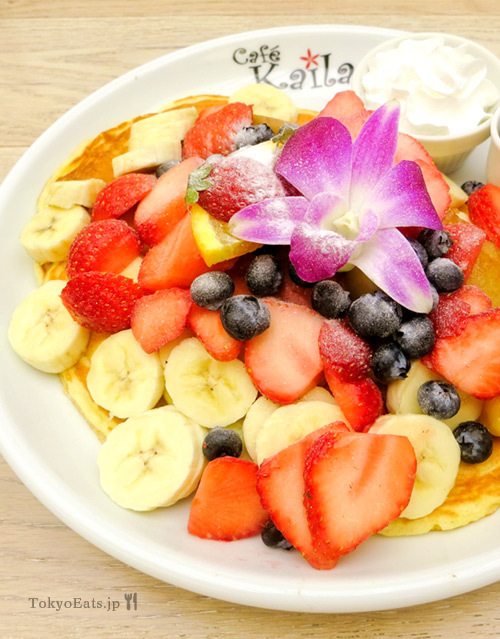 Cafe Kaila came from Honolulu, Hawaii and they supposedly received the “Best Breakfast” award 2 years in a row in Oahu. 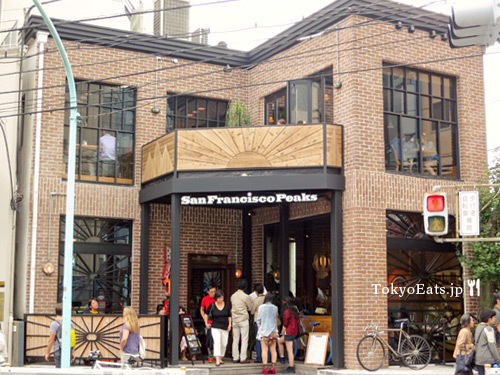 It recently opened in Meijijingumae/Omotesando and is located on the B1 floor of the same building as CHANEL, BVLGARI, and the MOMA design store. This place has the longest line I’ve seen for pancakes. Yes, longer than ‘Eggs ‘n Things’. It’s easily a few hours wait but perhaps it’s a bit less crowded if you go on a weekday. We happened to be in the area over the weekend and decided to check it out hoping that it wouldn’t be too crowded for dinner. We arrived at 7:15pm and guess what? They said their last order is at 7:20pm and the restaurant closes at 8pm but if we eat fast, they would let us in. Woo hoo! We delightfully agreed and went inside. We were so surprised we got to eat at Cafe Kaila without waiting. 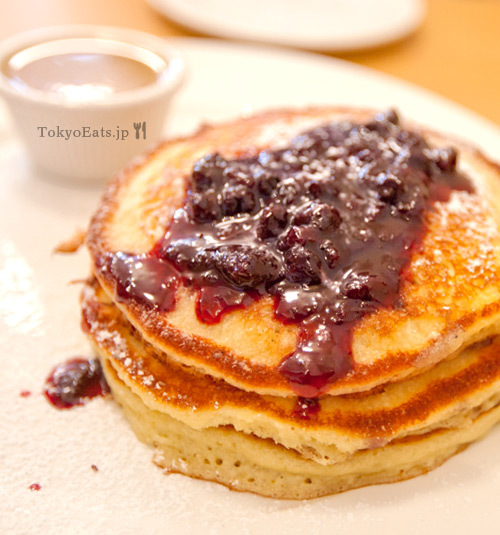 We ordered their famous pancakes for 2000yen, which is a bit expensive but it’s also got quite a large volume with a generous serving of fruits on top. I am happy to report that it does indeed live up to the hype. The pancakes were great and I would come back here if the line wasn’t long. Their breakfast burrito plate (1700yen) with Italian sausage (extra 50yen) was also good and we were so satisfied with our meal here. They are impressively on top of their service too. 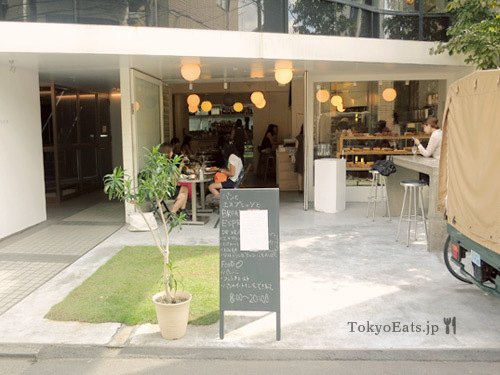 If you are into pancakes and/or want a good breakfast, come here! Have you heard of Açaí? It’s a berry from Brazil that is a dark colored fruit and is known to be rich in antioxidants and fiber. 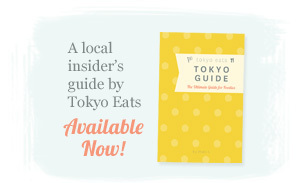 It’s a super food that has many health benefits and has become popular here in Japan. 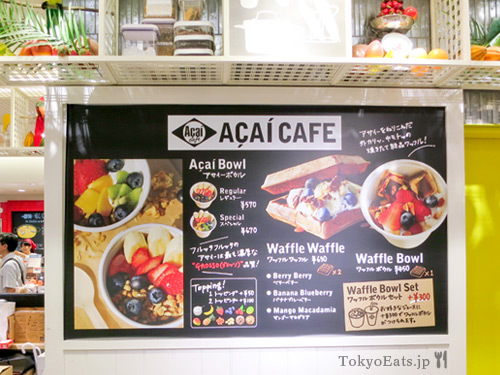 Açaí Cafe happens to be located inside of Shibuya Hikarie’s ShinQ B3F location and there’s always someone picking up a drink or snacking on their Acai Bowls (which you can eat there). Since this was my first time trying Açaí, I didn’t know what to expect, but I’d have to say it’s not bad at all. It feels like blackberry + blueberry combined and although the color is not so appetizing, the Açaí Banana juice was easy to drink and it felt good for the body. 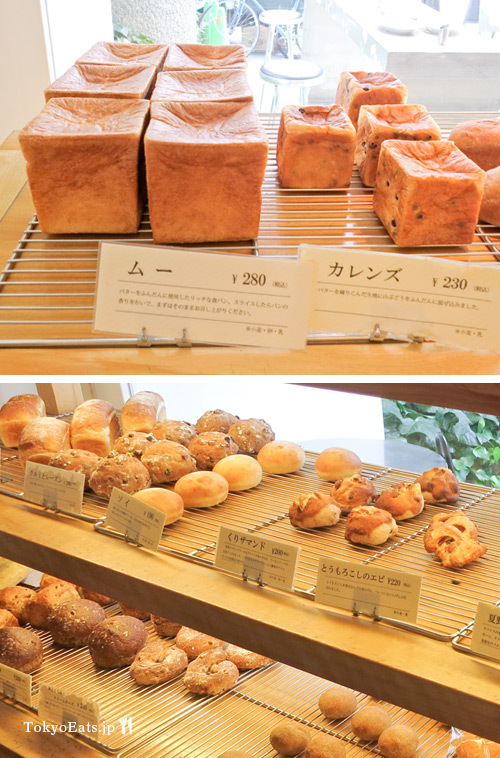 Most drinks are: Regular size 450yen, Large size 550yen. When you get a drink, you can add the waffle bowl for only 300yen extra (instead of paying the full 450yen) so we decided to try that as well. I’d have to say the waffle bowl was nothing exciting. If you want the full experience, I would go for the Acai Bowl for 570yen or the Acai Special Bowl which comes with more fruit for 670yen. If you’re feeling like you need to detox, or lacking in antioxidants and fiber, grab your quick fix of Açaí at Hikarie.